Compared with Kings and Queens of yesteryear the current royal usurpers have it very easy. The odd expenses paid trip, interference in the odd referendum, right off an expensive Land Rover. No cold and bleak castle for them, a warm and rather large council house in a popular part of London, and they don’t pay for their extra bedrooms. You always know when they’re at home because there a Glasgow Ranger’s flag flying from the roof. You only have to watch a queenly costume drama to prove my point. Your life constantly at risk from some relative who wants your job, army’s to raise, wars to fight, and the expenses paid trips take a lot longer. 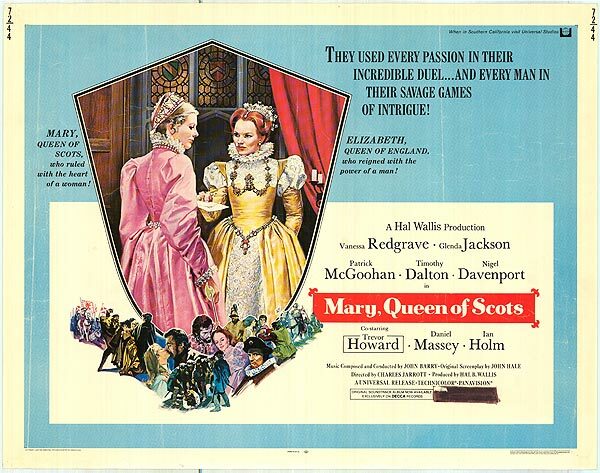 With the recent release of the 2018 Mary Queen of Scots I thought it would be the ideal time to revisit Charles Jarrott 1971 version. It’s quite an enjoyable royal romp that’s crowning glory is the acting of the two leads, Vanessa Redgrave, who plays Mary and Glenda Jackson, in the role of Queen Elizabeth of England, were both nominated for acting awards. The worst part of the movie was the Scottish accents that were varied and unconvincing. Following this viewing I await to see how the new, highly award nominated version, stands up.